Chronic back pain affects millions of Americans, and the statistics show that our aging and increasingly sedentary population will lead to more Americans suffering from this condition in the near future. Whether it be due to poor posture, some past trauma, or a degenerative disease affecting the spine, the main concerns of patients lie in the pain itself, and worries over the side effects of opioid pain killers. 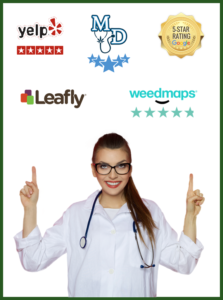 The general pain-relief benefits of medical marijuana are anecdotally known, supported by many studies, and are discussed elsewhere on this page. Specific to the relief of back pain, a study in the Canadian Medical Association Journal found that medical marijuana offers significant pain reduction to patients afflicted with neuropathic pain, a common source of back pain; additionally, even when the cannabis was not the sole medication being taken for pain relief, its use reduced the dosage and frequency of the prescribed opioid. This isn’t all: animal studies clearly show that the CBD in cannabis directly protects the soft disks of the spine from further damage.